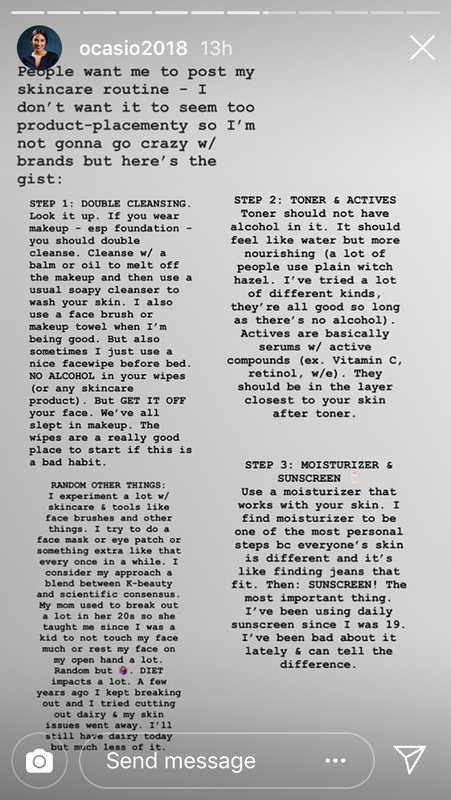 Alexandria Ocasio-Cortez shared her daily skincare ritual on social media, proving you can be a smart, effective, badass congresswoman and still make time for a multi-step skincare routine. 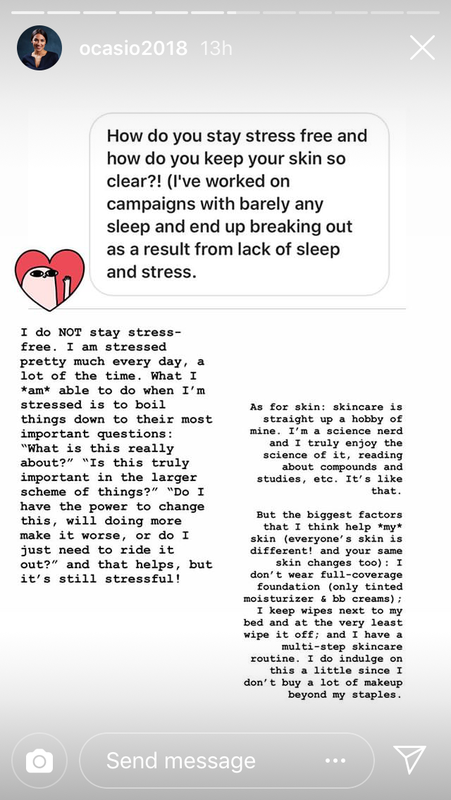 One of Ocasio-Cortez’s Instagram followers sent her a DM asking how she keeps her skin so clear when working a high-pressure, stressful job. The millennial congresswoman is, unsurprisingly, a big fan of skincare routines and super knowledgeable about skin, too. In general, Ocasio-Cortez tries to limit her dairy-intake (the dairy/acne connection is real), wears minimal makeup, and calls her skincare approach “a blend between K-beauty and scientific consensus.” Ocasio-Cortez broke down her skincare and makeup routine without naming specific brands for fear it would sound like an #ad. “If you wear makeup — esp foundation — you should double cleanse,” she explained. “Cleanse w/ a balm or oil to melt off the makeup and then use a soapy cleanser to wash your skin.” She added that she’ll use a makeup towel or face brush when she remembers to. AOC likes toners but cautions against using any with alcohol on the ingredient list. She’ll follow up her toner with an active—which she calls “basically serums” (she’s right)—and opts for actives with ingredients like Retinol or Vitamin C.
She calls sunscreen the “most important thing” and says she’s been using it daily since she was 19. 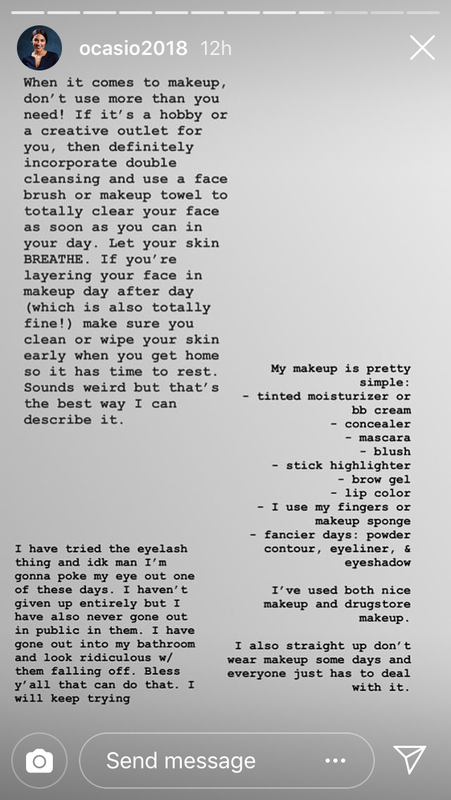 Ocasio-Cortez likes a no-makeup makeup look, which for her consists of: tinted moisturizer or bb cream, concealer, mascara, blush, stick highlighter, brow gel, and lip color. However, she’s a big fan of letting her skin breathe and doesn’t wear makeup every day. For those who are interested, that no-alcohol-toner rule is a game-changer. And this is a delicate reminder that talking about or liking skincare does not minimize a woman’s accomplishments.